Memoirs of the House of Brandenburg. Frederick II, King of Prussia. 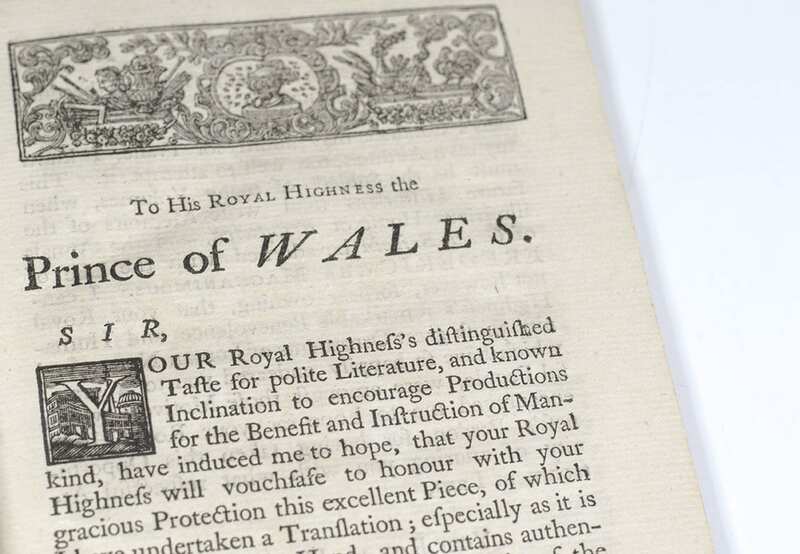 London: Printed for R. Dodsley, 1748. Early English translation of Frederick II, King of Prussia’s history of the Brandenburg Dynasty. Dedicated to his Royal Highness to Prince of Wales. Authors Preface. Initially published in three installments by Frederick II’s private press at the palace of Sanssouci near Berlin, the volumes were read as part of the curriculum at the Prussian Academy of Sciences and considered as the fourth volume of Frederick’s Oeuvres du Philosophe de Sans Souci (The works of the philosopher of Sans Souci). Small octavo, disbound with part of the original gilt spine intact. In very good condition. A nice example. Frederick the Great was King of Prussia from 1740 until 1786, the longest reign of any Hohenzollern king. His most significant accomplishments during his reign included his military victories, his reorganization of Prussian armies, his patronage of the arts and the Enlightenment in Prussia, and his final success against great odds in the Seven Years' War. Frederick was the last titled King in Prussia and declared himself King of Prussia after achieving full sovereignty for all historical Prussian lands. Prussia had greatly increased its territories and became a leading military power in Europe under his rule. 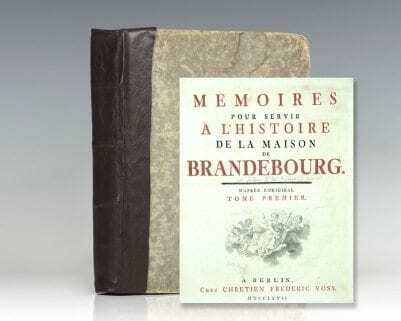 Memoires pour Servir a l’Histoire de la Maison de Brandebourg (Memoirs of the House of Brandenburg). Berlin: Chez Chretien Frederic Voss, 1767. Early example of Frederick II, King of Prussia’s history of the Brandenburg Dynasty. 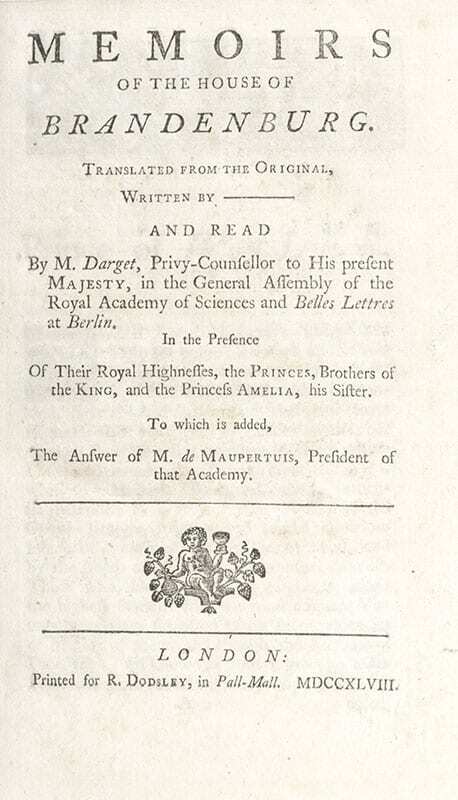 Initially published in three installments by Frederick II’s private press at the palace of Sanssouci near Berlin, the volumes were read as part of the curriculum at the Prussian Academy of Sciences and considered as the fourth volume of Frederick’s Oeuvres du Philosophe de Sans Souci (The works of the philosopher of Sans Souci). Quarto, three volumes bound into one, rebacked, contemporary boards, elaborate engraved allegorical frontispiece by Georf Friedrich Schmidt, two folding genealogical tables, two folding maps. In very good condition.